Mr. James Thomas "Jim Tom" Milby of Summersville, Kentucky, son of the late Boyce "Dude" Milby and Mary Maxine Lobb Milby, was born on August 4, 1957 in Taylor County and departed this life on April 11, 2019 at the University of Kentucky Medical Center in Lexington. He was 61 years, 8 months and 7 days of age. He had made a profession of faith in Christ and was a member of the Holly Grove Baptist Church. He served in the U.S. Army National Guard for six years. He also was a farmer, mechanic and assistant to the Green County High School Football team from 1998-2008. Survived by his wife of 36 years, Tammie Ranee Wright Milby of Summersville, having united in marriage on October 22, 1982. Other survivors include: one son and daughter-in-law: Kyle and Karie Milby of Summersville; one daughter and son-in-law: Erin and Brian Tolbert of Bethpage, Tennessee; six grandchildren: Katlyn Lashae Milby, Koltyn Jamison Milby, Kannen Blake Milby, Kaiden Nicholas Milby, MaKenzie Ranee Ray and Brooklyn Grace Ray; one brother and sister-in-law: Bro. Boyce Stanley and Carol Milby of Russell Springs; one sister: Linda Durrett of Greensburg; a mother-in-law: Shelby Wright of Summersville and a host of other relatives and friends. Mr. Milby was also preceded in death by a sister and a brother: Janice Miller and Mitchell Dean Milby and a father-in-law: Freeman Buck Wright. 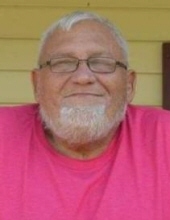 The funeral services for Mr. James Thomas "Jim Tom" Milby will be conducted at 1:00 P.M., Central Time Monday, April 15, 2019 at the Holly Grove Baptist Church with burial to follow in the Whitlow Cemetery. Bro. Leslie Jewell, Bro. Dannie Nelson, Bro. Dennis Penick, and Bro. Stanley Milby will be officiating. Visitation is requested from 3 P.M. until 8 P.M., Central Time, Sunday at the Cowherd and Parrott Funeral Home; from 7 A.M. until 9 A.M., Central Time, Monday at the funeral home; and after 10 A.M., Central Time, Monday at the church until time of the funeral service. Memorials are suggested to the family burial fund, or the Whitlow Cemetery fund, which can be made at the funeral home or the church. Cowherd and Parrott Funeral Home in charge of the arrangements. To plant a tree in memory of James Thomas "Jim Tom" Milby, please visit our Tribute Store. "Email Address" would like to share the life celebration of James Thomas "Jim Tom" Milby. Click on the "link" to go to share a favorite memory or leave a condolence message for the family.